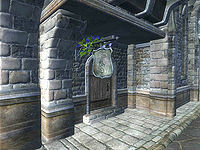 All Things Alchemical is an alchemical supplies store in the northern half of Skingrad. It is found across the street from Lazare Milvan's House and next to Colovian Traders and Hammer and Tongs. The proprietor, Falanu Hlaalu, has 800 gold and a Mercantile skill of 40. When bartering, she will buy and sell potions, alchemical equipment, and ingredients. Her wares include the unique Ring of Wortcraft which drains your Intelligence while fortifying your Luck, Alchemy and Endurance. There are three floors in this store. The ground floor contains the main trading area, which consists of a counter with a selection of Falanu's wares on display. The second floor contains a work area and the third floor consists of a storage room, a dining room, and Falanu's bedroom (the last two rooms are locked). The shop in Skingrad seems to be a replacement for an earlier store on the southeastern shore of Lake Rumare. More information is available here. There are two locked barrels in an upstairs room that are as marked as requiring a key, but no key in the game opens them. This page was last modified on 25 January 2016, at 11:00.